In a week the flag referendum changes, the stalemate is broken by the Green Party pushing through an amendment supported by the National Party to add Red Peak to the first referendum. The flag referendum has become a wheelbarrow issue, that is, every one is pushing it in the direction that they want it to go. The reptiles in charge of the country have decided to re-brand us in an exercise that I don’t find is nation-building. The prime minister wants this to be his legacy when he leaves office. That he remade us in his image. When I get my papers for the first referendum I will make my choices. I will be voting Red Peak and the Koru flag. 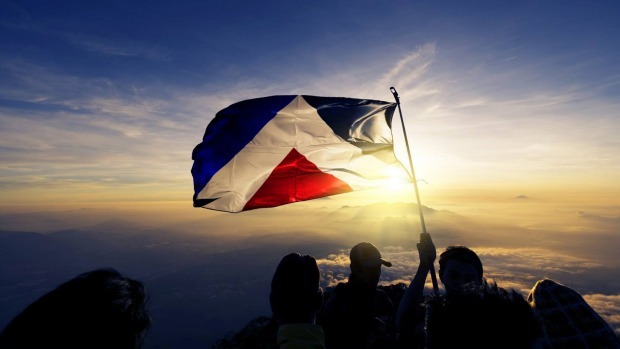 If Red Peak makes it through to the second referendum I will be voting to support it. If it doesn’t I will vote for status quo. I’ve finished some books from the library and returned them. I think London Falling by Paul Cornell suffered for being his first book. His training for writing has been scripting for television and comics. The books I have read by people coming out of those fields have been okay, if the characters felt flat and unrounded. The characters did not come alive, instruments of the plot. No later books on the shelves but I will continue with the series when I see them. The Water Knife by Paul Bacigalupi was a grimmer book, a near future dystopia where the ancient aquifers of North America have run dry and the continent is turning to desert. One by one the individual states of America are failing. They are closing their borders. Texas has fallen, Arizona is failing, and Nevada and California are in a hot/cold struggle to claim the last of the spoils. Bacigalupi pushes his characters to the edge, every effort to survive just leads to greater disaster. It’s grim reading because his science is feasible. This is where the trends are taking us. I added one book to my reading. After the reading the suggestion that Arkady and Boris Strugatsky are writing about civilisations that could become the early days of what would become Iain Bank’s the Culture, I sent a librarian on a search of the stacks to bring back Hard to be a God, the first title of their works that the library holds. I often sat in the old Intercity Bus Terminal in Dunedin. I would be waiting for a bus to come in from Invercargill, or waiting for the bus that would take me there. I don’t travel much otherwise. Sitting on the benches I would gaze on the bunting that had not been taken down since the last Rugby World Cup. It was a diversion to run through the flags on display in the bunting and identify them. I couldn’t tell you the order now. I figured out most countries. Either they were obvious by their flag, or if I could deduce the identity of the flag by remember what rugby-playing nations were participating. What intrigued me was that New Zealand was represented by both the New Zealand flag and by the New Zealand Rugby Union Silver Fern flag. I speculated on the All Blacks being a different team to New Zealand, perhaps they come from Alblacia (near Albania perhaps? ), or All-Blackistan (a former Soviet republic). The Irish also played under a composite flag which I guessed included players from the four counties of their rugby union, rather than play under the competing flags of their politically divided island, the Irish Republican Tricoleur and the Union Jack. They were the only team not represented by a national flag. If All Black Land is a different country to New Zealand then I view the flag referendum with more ambivalence. The whole thing looks like a hatchet job. The prime minister’s office has decided to re-brand us with a new flag that scrubs off the Union Jack, another step on the process of our new corporate nation. The prime minister favours a silver fern flag. We still want a flag that looks like the old one. There is the old joke that a camel is a horse designed by a committee and the options in the flag referendum fit that description. The first referendum will be ‘which option do you like?’ and the second referendum ‘do you favour the new flag or the old one?’ My opinion is not to vote in the first referendum, and vote ‘keep the old flag’ in the second. I confess I think the koru flag, popularly called the Hypnoflag is a solid, identifiable flag, and of the four I favour it. It’s trailing fourth in popularity and I think it is not a goer. It will unfurl over New Zealand when R’lyeh rises from the ocean depths to cast its shadow over the country. I would drag myself out to vote for Red Peak. It’s a simple design, four colours, three triangles of black, red and blue separated by a white division. It has immediate symbolism, The black is the night, the world of potential, Te Po in Maori, the blue is the day sky, the world of realisation, the world of light, the created universe (Te Ao Marama? ), the red the dawn light, the white forms the gateway, Te Maihi. It’s simple, it works. Left out of the four front runners, it’s the underdog. The petition to include it shows support. However the Prime Minister has said that he wants cross-party support to include it, and the leading opposition party which not endorse that support unless the second referendum, the yes/no question, comes first. I admire the prime minister’s political sense in how he has played his hand in giving his opposition a Hobson’s choice, even if I don’t approve. It’s very canny. He has given his critics the options of backing down or paralysing an option with popular support. Well played, sir; very underhand of him. If the fifth flag is left out then it remains a curiosity of what could have been, a rallying flag for dissent. We began retreat last weekend with a crowd breaker exercise. Everyone wrote down one thing the rest of the group didn’t know about them. I wondered what I wanted to share about myself. I wrote ‘father was a linesman’. They were read out and we guessed which one around the circle. Mine was one of the last. I was asked if he fell from grace. Yes, he did. He had a stroke, or something similar, while up a ladder and fell to his death. This was back in the 1980s when I was still at school. I did not regret sharing it. As I have said elsewhere I do not mourn my dead as much as I take joy in remembering them. I was happy to talk about dad and would have said more. An honoured memory. On the book front, I have finished Rivers of London, by Ben Aaronovitch. It was an entertaining read, a diversion about the police department that deals with the magic side of the city of London. I will look out for Moon over Soho, the next in the series. Currently I’m reading London Falling, a darker book by Paul Cornell, again about London police, and a much darker occult. For the first 80 pages the characters seemed to blur and slide in my reading, they didn’t have distinct voices in my head. Now the story has kicked in and the magic begins to get more interesting. I’m currently working on translating some sentences from Maori Language Week into Brithenig. While it is topical I want to have a go at the poem Home, by Warsan Shire. A friend read my blog and asked me where I was. I’m across town in an old house halfway between Columba Collge and the green belt. It’s an old character house. This is a nice way of saying it could be warmer,. The owners are away until the end of the month on a tour across Northern Ireland, Scotland and England. Mostly cathedrals. Every so often I see a little photo story from St Magnus in Orkney, Petersborough, Ely or Jarrow. It could be warmer, especially today with spring snow in Dunedin. The days are getting earlier in the hypernotides, the islands beyond the south wind. I wake up to the cold blue sky of the pre-dawn. Also picked up some books from the library that I have been waiting to read: Rivers of London, the first in the series by Ben Aaronovitch about the wizarding and supernatural cops of that city. The protagonist, new cop Peter Grant, is a little slow. I worked out about 100 pages ahead of him that the big bad he is hunting is a popular sea-side puppet anti-hero, who just happens to be on the cover! I am enjoying reading the magic training classes Grant is doing, so far making balls of light, levitating apples, and now up to casting fire balls. I haven’t read this kind of description in a while. The Water Knife, by Paolo Bacigalupi, is sitting on my dressing table. I’m getting through it more slowly, only my second chapter in. It’s a different kind of fiction. I have set Saints of the Shadow Bible aside while I work through the library books. At work I have swapped Poems by Iain Banks and Ken McLeod for McLeod’s Descent. It was a mutual swap for titles the other had not read. After looking at the dictionaries again it looks like ill pasedig a weddir will remain the word for boarding pass.